Bigotry is the state of mind of a bigot: someone who, as a result of their prejudices, treats other people with hatred, contempt, or intolerance on the basis of a person’s ethnicity, religion, national origin, gender, sexual orientation, disability, socioeconomic status, or other characteristics. 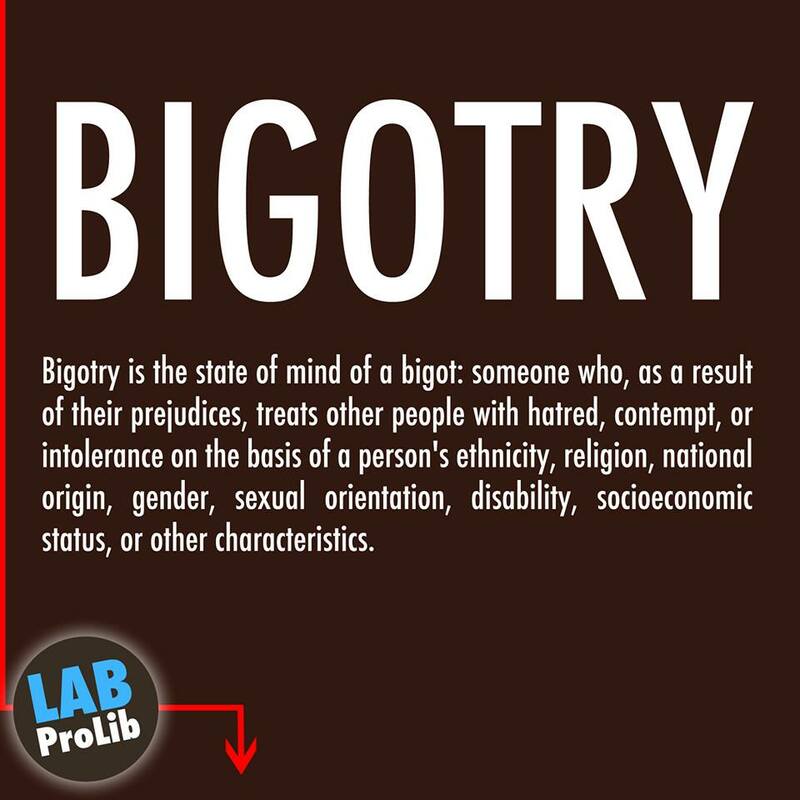 The origin of the word bigot and bigoterie (bigotry) in English dates back to at least 1598, via Middle French, and started with the sense of “religious hypocrite”. This meaning still survives in Italian, in the cognate word bigotto. The exact origin of the word is unknown, but it may have come from the German bei and Gott, or the English by God. William Camden wrote that the Normans were first called bigots, when their Duke Rollo, who when receiving Gisla, daughter of King Charles, in marriage, and with her the investiture of the dukedom, refused to kiss the king’s foot in token of subjection – unless the king would hold it out for that specific purpose. When being urged to do it by those present, Rollo answered hastily “No, by God”, whereupon the King, turning about, called him bigot, which then passed from him to his people. This is quite probably fictional, as Gisla is unknown in Frankish sources. It is true, however, that the French used the term bigot to abuse the Normans. The French used to call the English les goddams after their favorite curse; Clément Janequin’s “La Guerre”, which is about the Battle of Marignano, similarly uses the Swiss German curse ‘bigot’, i.e. “by god!”, in a context about the Protestant Swiss. According to Henry Bradley, the meaning of bigot in the Old French was “detested foreigner”, “heretic”, and it is supposed that the word was a corruption of Visigot. To the Catholic Franks, the Visigoths of Southern France and Spain were the objects of bitter hatred, both on religious and worldly grounds.